Perfume, aromatic and medicinal plants are part of the Baronnies Provançales’identity. One need only take a walk, to realise this. While wandering, it’s quite common to come across wild thyme, rosemary or even lavender fields. Landscapes and fragrant prints, these plants are completely part of the preserved quality of life and represent an art of living : thermal baths and spa, aromatherapy, quality cosmetic products to discover ! Infusettes are aromatic plant infusions, produced and packaged in the Baronnies Provençales’ massif. In accordance with the terms of reference established by the organic agriculture. A bag of infusettes means 28 infusions : 4 linden, 4 lavender, 4 thyme, 4 rosemary, 4 fennel, 4 verbena and 4 balm infusettes. Available for sale in the Tourist offices, “relay of Park” and at the hosts. An opportunity to taste a piece of Baronnies Provencales ! From North to South, from East to West, every valley has its climate, its productions and its specialities. Not less than 6 Protected Designation of origin (PDO)/ Controlled Designation of origin (AOC), 7 Protected Geographical Indication (PGI) and 2 projects. Strolling through the Park, is venturing down the paths of authentic flavours. It’s pitch dark, now is the time to open your eyes wide. Far from the metropolitan areas, the night sky of the Park invites you to contemplate and to escape thanks to its depth and its sharpness. Its blackness is ideal for observation. While exploring the park, you’ll discover many points of view to observe the nature. Curious visitors with binoculars or telescopes discover the full nature astronomy in a preserved environment. The most adventurous ones can take a walk beneath the stars, to benefit from the freshness of the night, when nocturnal animals go out. Bats, owls, insects… a whole range of wild fauna to (re)discover ! The cliffs are an exceptional setting for practicing climbing : more than 1500 equipped tracks for all levels, and also climbing sites known internationally. 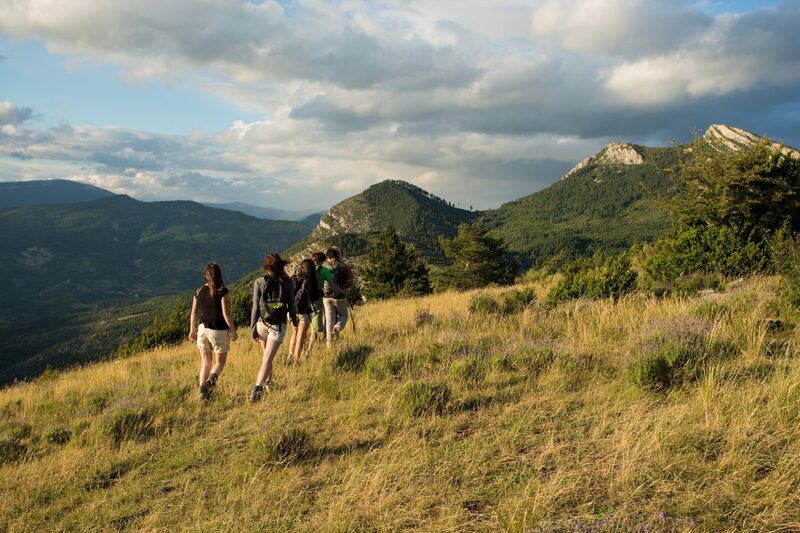 The Baronnies Provençales offer a large choice of walking trails through lavender fields, orchards, marl hills and lime stone. Walkers, runners, riders and bikers can explore the vast network of trails. The hilly relief offers diverse and charming trails. Bikers can warm up before the challenge of the Mont Ventoux, the neighbouring mountain. You can discover the mountains of the Park also by air : one of the best aerologies of France, and a joy for paragliders and hand-gliders.